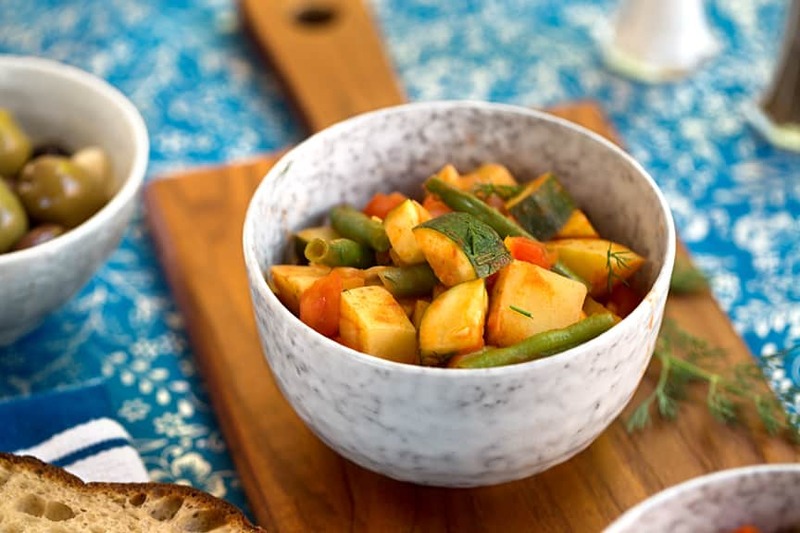 Here’s a simple Greek potato stew bursting with summery flavors — green beans and zucchini in a mellow tomato base. A fresh, crusty bread rounds out the meal along with a big green salad with some chickpeas tossed in. For a company meal, add Olive Bar Medley with Tofu “Feta” as an appetizer, and a good wine. 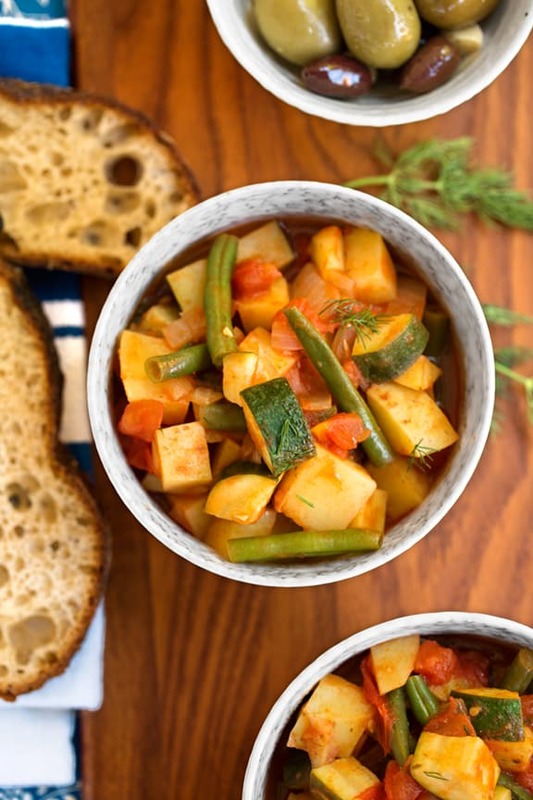 Heat the oil in a large soup pot or steep-sided stir-fry pan. Add the onion and sauté until golden. Add the garlic and continue to sauté for a minute or two. Add the potatoes and 1 cup of water. Bring to a rapid simmer, then lower the heat, cover, and cook over medium heat until the potato chunks are about half-done, just to the point when you can pierce them through with a fork. Add the zucchini and green beans. Simmer over low heat for about 20 minutes, or until the vegetables are tender but not overdone. Add the tomatoes, tomato paste, oregano, half of the fresh herbs, and 1 cup more water. Cook until the tomatoes have softened, 5 to 10 minutes longer. Stir in the remaining parsley or parsley/dill combination, then season to taste with salt and pepper. Add a bit more water if need be — this should be a thick stew, not too soupy. Serve at once. NOTE: Unless it’s truly green bean season (midsummer or so), make the dish easy and foolproof with frozen whole organic green beans. Tough fresh green beans can break a dish; however, if you have a good, tender batch, by all means use them. 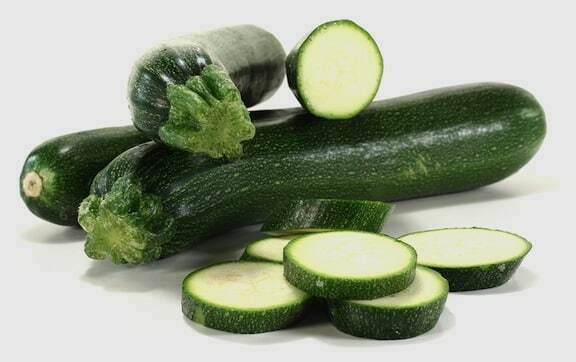 recipes for zucchini and other summer squashes. recipes for making the most of green beans. I’m curious about what the consistency is of this when it’s done cooking? Soupy, stewy, saucy? Erin, since there’s very little water, it’s a thick stew. If you’d like it more like a soup, add more water until it’s at the consistency you like. Irene, what a good idea. For our American readers, aubergine is eggplant, and it would indeed be a great addition to this dish. Thanks!